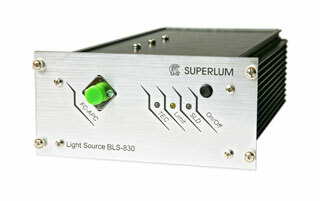 BLM-S-series Broadband Light Source Modules are 9 volt DC powered compact versions of AC-powered S-series Broadlighters. They are based on Superlum's most high-power and broadband superluminescent diodes. These modules may be used either as standalone light sources or being integrated into an appropriate benchtop system. A polarisation insensitive optical isolator is installed in all standard models of these light source modules. Very high output power—up to 30 mW in selected models. Very broad spectrum—up to 70 nm in selected models. Simple installation in a 19" rack (a 19" rack mount kit is required). Customized versions based on any Superlum's SLD and tailored to specific requirements are available upon request. Electrical Power: +9V DC, 2A. Overall dimensions: 246 × 129 × 65 mm (9.69 × 5.06 × 2.55 inches). Remote control: Remote control port. Fiber output: FC/APC mating sleeve, 1 meter FC/APC-to-FC/APC cable is shipped with all light sources. Download Technical Product Specification in PDF format (446 KB) .